You don’t have to let misaligned teeth stand between you and a healthier, more confident smile. At Yenzer Family Dental, we’re proud to say that we offer Invisalign, the popular cosmetic braces system that’s helping patients transform their health and wellbeing around the world. Unlike traditional braces, which use unattractive metal brackets and wires to straighten teeth, Invisalign relies on discreet trays that are clear and almost invisible. When you begin your treatment, we’ll give you a series of these aligners. You’ll wear each one for 20 – 22 hours each day for about two weeks. Every time you graduate to a new aligner, your teeth get a little bit closer to where they’re supposed to be. The treatment process with Invisalign is pretty easy. 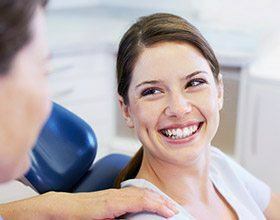 It starts with a consultation in our office, where we’ll talk to you about your smile goals, take some X-rays, photographs, and impressions, and perhaps even show you a digital preview of what your smile might look like after Invisalign. This is the perfect opportunity to ask your dentist in Chesterfield any questions you have about the treatment. Throughout the process, you’ll stop into our every four to six weeks or so for periodic checkups. We’ll see how your teeth are doing, provide you with new aligners, and (hopefully) listen to your positive feedback about how you’re noticing the changes in your smile. Because the aligners are removable, you’ll never have to worry about dietary restrictions like you would with traditional braces. All you have to do is remove the aligner, enjoy your food, rinse the aligner, and replace it in your mouth. 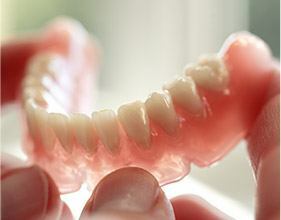 The removable nature of the aligners also makes it a breeze to brush and floss your teeth. There are no annoying metal brackets and wires to navigate around. Invisalign is more comfortable than metal braces; there are no metal bits to irritate your gums and cheeks. Many patients have also remarked that Invisalign is less painful than its old school counterpart as it moves the teeth. Invisalign is fast. Treatment time varies from case to case, but the average duration is about a year. You may start to notice results in just a couple of months. Traditional braces often take 18 months or longer to complete their work. There is a small blue compliance dot on the aligners that come with Invisalign for teens. Parents are able to keep an eye on whether their adolescents and cooperating with the treatment. Since Invisalign is often considered a necessary treatment, your insurance may help you to pay for it. What Is Life Like After Invisalign? Improve your oral health. A misaligned bite and crooked teeth can cause jaw problems and present challenges to oral hygiene. Invisalign corrects these issues. Boost your confidence. 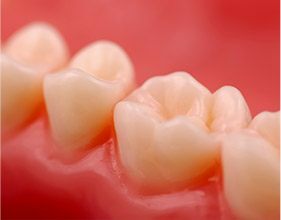 Crooked teeth can make you hold back from smiling, especially when you meet new people. With your straightened set of pearly whites, you probably won’t be able to stop smiling! Would you like to know if Invisalign from your Chesterfield dentist is right for you? Please contact our office to schedule your consultation with Dr. Yenzer.